I recall back in the Summer of 2000 being invited up to fish the famous Tulchan beat during an absolute scorcher of a heatwave. Although the pools were clearly stuffed with older fish the sun was absolutely splitting the trees by 11am and the focus for most of the fishing guests was on lunch & drinks in the fishing hut rather than casting a fly! I was more or less told I was wasting my time and there were no fresh about which was technically correct information. At exactly 5 minutes to 1pm while swimming a small silver stoat's tail through the only pool that had some tree shading covering a few metres of it a perfect fresh run fish of 8 lbs cooperated much to my surprise! That was the first of 3 fish that I landed that day and the other 2 came as the light was fading and I was starting to sober up following an amazing Tulchan fishing hut lunch! In the cold Spring days I love to see sunlight as it just adds a degree or two of warmth to the surface of the river which definitely encourages the 'awakening' & movement of Spring salmon. During early Spring the sun isn't intense either as it's much lower in the sky so no real harm done. During the warm Summer weather it's a completely different ball game and although salmon are often caught in bright light conditions more often than not you've got to look closer for pools where there's a bit of shading, oxygenated water and depth if you're serious about hooking a fish. 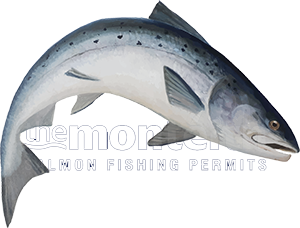 Salmon will take the shaded deep pool option if they have one and often pools that are not so often preferred in normal fishing conditions can be the only ones worth fishing through these low, bright light warm water conditions. During these intensely warm low water Summer fishing conditions you really need to be thinking about what salmon require when oxygen levels are generally running low. This is the time to pay attention to the fast water streams and especially ones with a bit of depth or near to a deep pool. If there's a subsurface pocket of slack water under the flow of a fast stream neck that would likely be invisible to you or I rest assured that a salmon will find & enjoy it! A stealthy approach with a small dark fly in the bright light could well be enough to force an interception so pay close attention to these faster streams in the heat of Summer as any salmon present in the beat are very likely to be holding in that specific area. The photographs above are of the Lady Pool & Island Stream Pool on the Dunkeld House beat which is exactly the type of partially shaded fast stream deep water characteristics I'm referring to.